AT least 15 people have been killed and 69 injured in two bomb blasts in the Turkish city of Istanbul, Turkey's interior minister has confirmed. The explosion took place outside the Vodaphone Arena stadium of Besiktas football club, where a game against Bursaspor took place earlier today, and appears to have been targeted at police. Officials said most of the victims were were police officers after the bomb exploded next to a police bus. Turkish President Tayyip Erdogan described the bombings as a terrorist attack. He said: "As a result of these attacks unfortunately we have martyrs and wounded. "Nobody should doubt that with God's will, we as a country and a nation will overcome terror, terrorist organisations ... and the forces behind them." 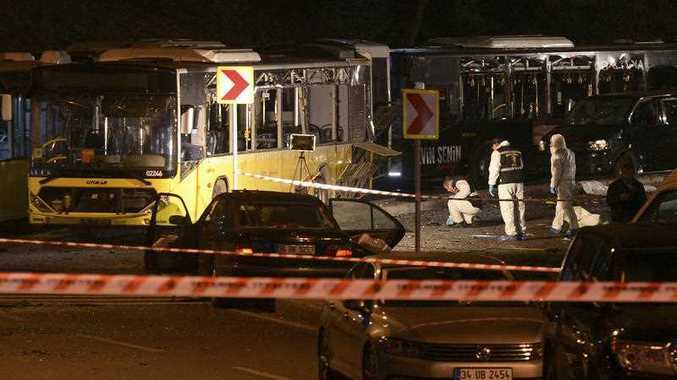 Turkey's Interior Minister, Suleyman Soylu, said one attack had taken place directly outside the stadium and another, believed to be a suicide bombing, was carried out in the adjacent Macka park. He told the state-run Anadolu Agency: "It is thought to be a car bomb at a point where our special forces police were located, right after the match at the exit where Bursaspor fans exited, after the fans had left. Eyewitnesses said they heard two explosions followed by heavy gunfire and saw many injured riot police officers. Pictures from the scene showed smoke rising over the city and residents reported hearing sirens as police rushed to cordon off the bomb site. Omer Yilmiz, who works as a cleaner at a nearby mosque, told Reuters: "It was like hell. The flames went all the way up to the sky. "I was drinking tea at the cafe next to the mosque. People ducked under the tables, women began crying. Football fans drinking tea at the cafe sought shelter, it was horrible." It comes two months after a bomb exploded outside an Istanbul police station, injuring at least ten people. In June, a bomb targeting a police bus killed 12 people and injured 51, while three weeks later gunmen killed 45 people at the city's Ataturk Airport. The government is currently urging a high degree of caution for those in the affected area. They're recommending people avoid affected areas, monitor the media for latest information on the security environment and follow the instructions of local authorities. Travellers should remain vigilant regarding their personal safety in Istanbul. The level of advice has not changed. They continue to advise travellers to reconsider their need to travel to Ankara and Istanbul and to exercise a high degree of caution in Turkey overall. Higher levels apply in some parts of Turkey.